Compiled by the then band secretary, Mr Justin Jones. The band was originally formed in 1888. Known as the Curtis & Harvey brass band. Practices were held at the School House in Dinas Terrace, Pontneddfechan. In 1893, the band later transferred to Glynneath. Band rehearsals were held at the Old White Heart Inn, known then as White Heart Terrace. In or around 1915, the band moved to the Woolpack Inn. The Conductor of the band was the late Mr John Morgan, he remained as Conductor until the year 1918. In the year 1906, a new set of instruments was purchased from Messrs Gisbourne of London, which cost at that time £150=00. During these day's, the band members contributed Three pence a week (pre-decimal). Money from engagements and cash collections at Christmas were all added together to help clear the debt for the instruments. In the same year 1906, another brass band was formed in the locality called the Aberpergwm brass band. The Conductor was a Mr Thomas Sands. During this period, both bands were very keen rivals. Unfortunately, the Aberpergwm brass band existed for a short period of only two years. In 1913, the Glynneath band attended their first band contest. It was arranged between Hirwaun band, Llywdcoed band and Glynneath. The competition was arranged to play a selection of Quartets and Solo's by various players followed by a Marching contest. The March contest was played on the main streets of Glynneath, it would seem that on this occasion, the streets were lined with people. It appeared there was more thrill and excitement in this type of competition than any other. In 1914, war was declared and the band was called upon to assist in the training of the V. T. C. recruits. A continuous demand for the band was required during that period. In the year of 1916. Glynneath band joined the West Wales Brass Band Association and entered their first band contest which was held at Ammanford. The band engaged a professional conductor to train them. A well known musician by the name of Mr Bob Howells of Aberaman. The band was successful on that day and they won first (1st) prize in class C and second (2nd) prize in class B. In the year 1918 the Conductor Mr John Morgan resigned and another conductor, Mr Chris Watkins was appointed for a short period of eighteen months. In 1919, a new set of instruments was purchased off Besson & Co. The purchase price was £600. In 1921, a Mr Ifor Rees was appointed as Bandmaster. Mr. Rees continued in this capacity until the end of 1923, when he then immigrated to India to conduct a military band. He was a very capable musician and improved the band to a very high standard. The band were now competing in the Championship section (Class A) and won a first (1st) prize at a contest in Llandovery. In the year 1924. Mr Alfred Casey was appointed as the new conductor. Another very able musician. Mr. Casey continued to conduct the band for twenty one years. In 1926 during the Miners Strike. Mr Casey took the band on a marching tour for two months. The band visited Carmarthenshire, Cardiganshire, Somerset, Devon and Cornwall. This march was to raise money for the soup kitchens. They collected over five hundred (£500) which they handed over to this worthy cause on their return home. At this time it should be mentioned that the bandsmen on the march received the sum of One Shilling a day to save or spend as they wished and daily dinners which consisted of corn beef sandwiches. In 1928, the band entered the National Eisteddfod at Treorci in the Rhondda and were successful in winning first (1st) prize. In 1930, they again entered the National Eisteddfod at Llanelli. On this occasion the coach they were travelling in caught fire. They just managed to arrive there in time to compete and won second (2nd) prize. Up to this period of time, the band had competed four times at the Crystal Palace in London. On one occasion, the band came fifth (5th) out of thirty five bands that were competing in their particular section. 1939 saw the band win a second (2nd) prize at the National Eisteddfod held at Cardiff and it was at this time that it was recorded in the minutes that Mr Alf Casey was a very capable and successful Conductor and had kept the band well together. Unfortunately, in 1945, Mr Casey decided to resign. This was very unfortunate for the band and a great loss as they had been competing in contests at Bridgewater, Rueadean, Fairford and Cirencester, where they had won first prizes at mostly all these places. It was then decided that they would advertise for another Conductor, but they were not successful. Therefore, the band was without a Conductor until 1947. It was during this year that Mr David Vaughan Jones who was at that time, the solo Cornet player of Glynneath who had joined the band in 1921 at the age of eight (8) years old, was appointed as Conductor and was given complete charge of the band. He remained as Conductor until the year 1981. To improve the standard of the band, Mr Jones commenced contesting with the assistance of professional Conductor's such as the well known Mr Haydn Bebb of Parc & Dare band. Mr Walter Hargreves of the Cory Band and Mr Tom White of the Ystradgynlais band. The band found these Conductors were of a great help and inspiration to their newly appointed Bandmaster and also to the band in general. After a short period of using the above named band coaches. Dai Vaughan as he was affectionately known by the band members and also the people of Glynneath, took charge of all other competitions and engagements. The band was very active for the rest of the years under the Baton of Dai Vaughan. At the Llanelli National Eisteddfod in 1952 the band won the second (2nd) prize, Dai Vaughan won the Trumpet solo, playing Haydn's concerto for trumpet in Eb. Exactly ten years later (1962) and again at Llanelli, Mr Terry Tilley (Dai Vaughn's Nephew) won the Trumpet Solo 15 to 18 years of age and again playing the same test piece. Haydon's Concerto for Trumpet in Eb. Terry had started playing at the age of Seven (7) and continued to play with the band until 1982. Glynneath Eisteddfod :- 2nd Prize. Fairford :- 1st Prize (In Selection). 1st Prize (Marching). Cirencester :-	2nd Prize. (1960). Cardiff Miners Gala :- 1st Prize. (1961). Beddau Contest :- 1st Prize. (1961). Class "C", 2nd Prize (1961). Class "B". Cardiff Miners Gala :- 2nd Prize. (1962). The band was also successful in 1962, when they came 1st in the Daily Herald Area Championships held at the Brangwyn Hall in Swansea on 26/5/62. At this contest, the winners also won the right to compete in the National Finals held in the Royal Albert Hall in London on 20th of October, 1962, in which they did compete. 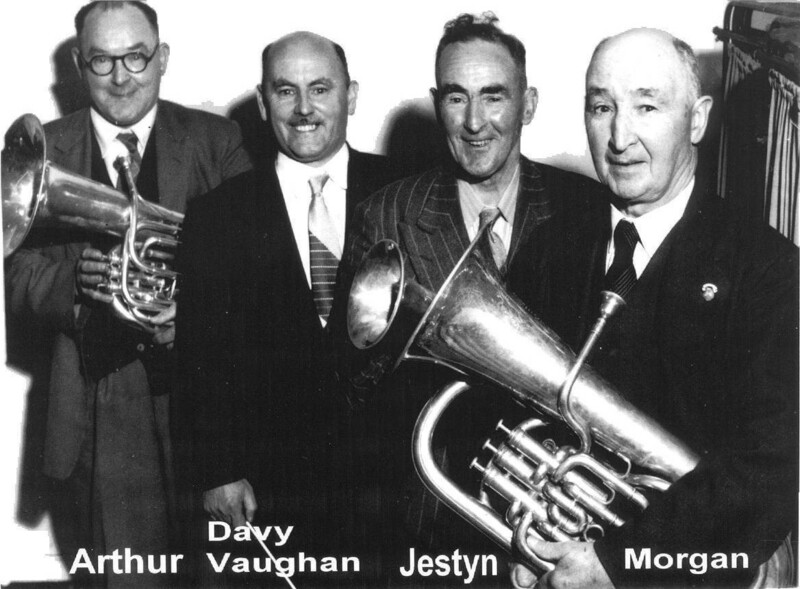 Brothers Arthur, Jestyn, Davy Vaughan and Morgan Jones between them have given 260 years of service to the Glynneath Silver Band. David Vaughan Jones was a playing member for 40 years before becoming the Musical Director for a further 30 years. During that period he also found the time to run a music section at the Glynneath Youth Club. This he did for a period of 40 years. His music took him all over Wales where he became well known as a musician and for the playing of The Trumpet Shall Sound from Handel's oratorio The Messiah. He was also a winner of the trumpet solo in the National Eisteddford of Wales in 1952. He was also a regular musician on the popular BBC radio programme "Welsh Rarebit" and performed with many well known artists such as Sir Harry Secombe etc. This write up and picture was in the local press around 2001. It is also on a plaque dedicated to them all in the Glynneath Town Hall.